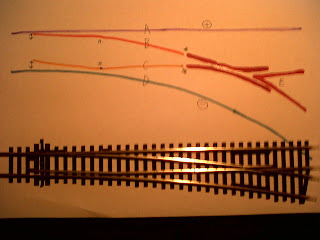 At last, I understand the electrics behind these sets of points (or turnouts, as they are called in the literature). It has taken me three months of staring at them in my hand, turning them upside down, scouring the internet, reading manuals and guide books and watching youTube videos. But today, I realised that the secret to understanding the electrics of a set of points is to break the device down into its constituent mechanical parts and then ascertain whether or not each part should have a positive or a negative electrical polarity. 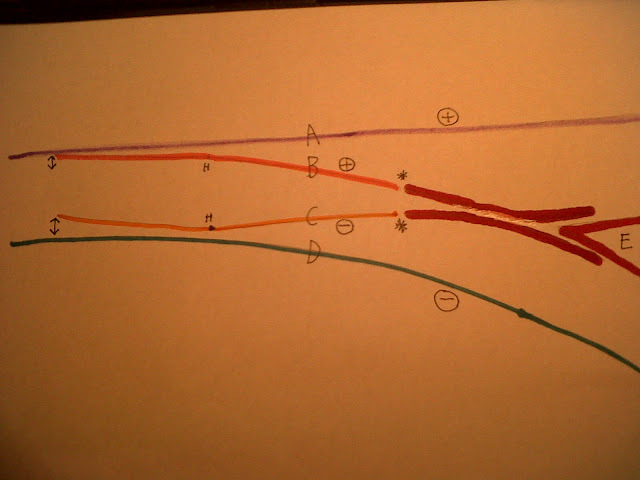 In this diagram I have colour-coded the different mechanical parts. Note the two sections that have been depicted in red and referred to as E.
The purple top-most line A is ALWAYS positive. The greenish bottom-most line D is ALWAYS negative. The pink section B is ALWAYS positive no matter which way the points are set. The orange section C is ALWAYS negative no matter which way the points are set. To ensure that B is positive one solders a wire underneath the points to join it with A. 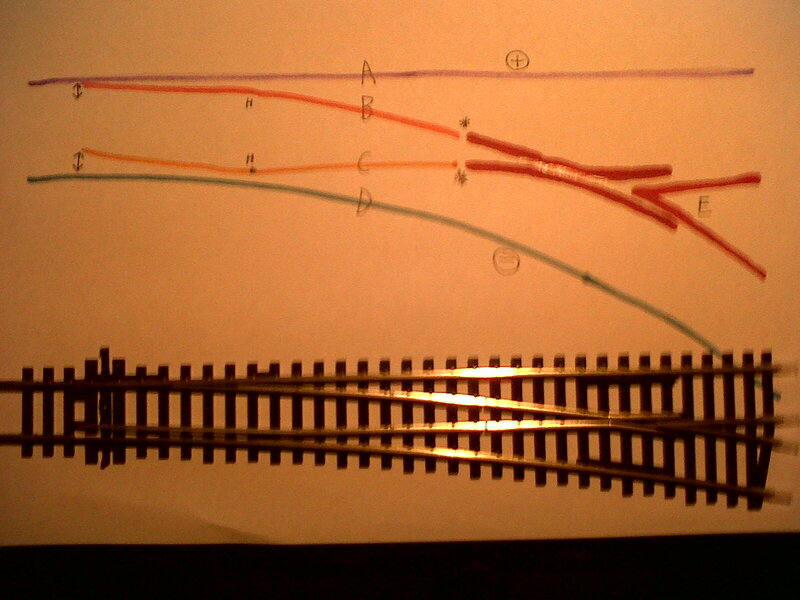 Likewise, to ensure that C is negative one solders a wire underneath the points to join it with D.
The two "H"s indicate that the two rails B and C are hinged so that the points can change direction. What I did not understand was that the two sections of E in red are electrically connected to each other with a little wire underneath the points. AND, that they must be electrically isolated from B and C by snipping two little wires underneath the points at * and * that join them. Why those little wires are there in the first place completely defeats me. Anway, now that I understand why they must be snipped, snipped they will be. It should be obvious from the diagram that if the points are set one way then E must be positive, but if they are set the other way then E must be negative. This is where the polarity switch plays its role. Just to clarify the relationship between diagram and points here is another picture. What concerns me considerably is that this revelation has taken 3 months to arrive. Surely, 20 years ago my brain would have grasped all this within a few hours of examining the issues. Is this an indicator of physical deterioration in the brain? Is that deterioration reversible, static or likely to worsen? He is one of the few pianists I would love to see perform. A few years ago he was appearing in Girona and Ryanair had direct and very cheap flights there from Prestwick airport. Should have acted upon that impulse, but didn't. He does not use a piano stool but a variety of old office chairs. Here is an extract from a review. 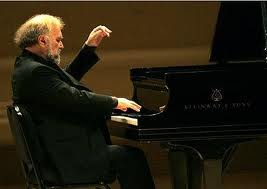 "Radu Lupu is one of those rare pianists who can be identified from a mere handful of notes. His distinctive soft-edged sound is like a cat padding across velvet. Even the Barbican's big brash Steinway succumbed to his caressing touch. Leaning back on his sawn-off typing chair, he paws the keyboard from arm's length, as if the exquisite pain of proximity would be just too much to bear." I notice that in this youTube video, the conductor is also in a comfy chair.